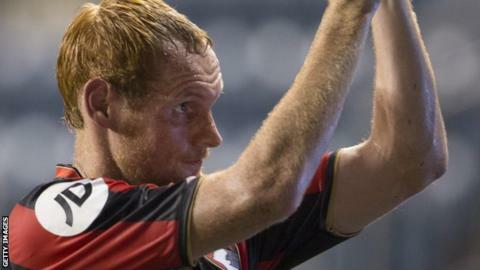 Bournemouth boss Eddie Howe admits he may be forced to use the January transfer window to bring in a replacement for Shaun MacDonald. The Cherries confirmed MacDonald ruptured ankle ligaments on Saturday and will not play again until March. The 24-year-old midfielder has been a key member of a Cherries side that have now gone 13 games unbeaten. "I don't think we've got a Shaun MacDonald-type player like-for-like we can bring in," Howe told BBC Solent. MacDonald has played every game during Bournemouth's 13-game unbeaten run but was replaced in the first half of Saturday's 1-0 win against Colchester. And Howe admits his absence will be a huge loss for the Cherries and may mean there is a new arrival at the Goldsands Stadium in January. "It might mean we have to be a little bit more flexible in the way we set up," he said. "It may mean we have to be creative and although we do have players who can play a similar role, Shaun was unique in terms of his qualities. "But whether we bring one in from within, or whether we tweak our system, or whether we look to bring a loan player in January, all options are available to us at this moment."